Since their invention, road vehicles have provided convenience, flexibility and value creation across the world. As their popularity and numbers grew, so did their carbon footprint and air quality implications. To reinvent itself as a clean and sustainable means of transport, the industry has invested heavily in technological solutions to improve conventional powertrains and develop AFVs and CAVs. These investments should enable the industry to meet the government’s ambition to end the sale of new conventional petrol and diesel cars and vans by 2040 and for almost every car and van on the road to be a zero emission vehicle by 2050. However, this cannot be achieved by the industry alone. Consistent policy drivers from the government are needed to instil confidence in the general public that electrified vehicles are a realistic proposition for their needs, by overcoming the 3As: range Anxiety, infrastructure Accessability and product Affordability. Only then will it be possible to achieve decarbonised and clean road transport. The UK new car market declined in 2017 for the first time in six years. The market fell 5.7% to 2.54 million units registered. Despite the overall decline, the market remained the second biggest in the EU, behind Germany. The most popular vehicle choices were superminis, small family cars and SUVs (dual purpose), with the latter the only segment to show growth in demand in 2017. Around one in every five new cars sold in the UK in 2017 was dual purpose, up from one in 10 in 2012. The AFV market grew by 34.8%, with almost 120,000 units registered. This represents the sector’s highest annual market share of 4.7%. Hybrid electric vehicles (HEVs), plug-in hybrid electric vehicles (PHEVs), battery electric vehicles (BEVs) respectively made up 60.6%, 28.1% and 11.4% of the AFV market. 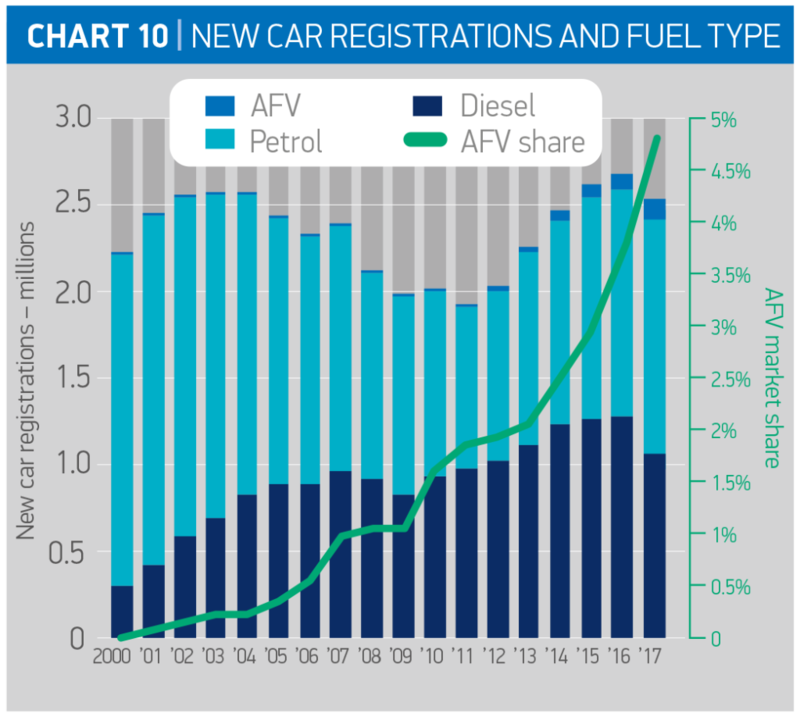 Demand for petrol cars also rose by 2.7%, with diesel registrations declining by 17.1% owing to anti-diesel rhetoric and policy change announcements. The new light commercial vehicle (LCV) market declined in 2017 by 3.6% but remained at more than 360,000 units. The new heavy goods vehicle (HGV) market declined by 2.6%, with 45,045 trucks registered.